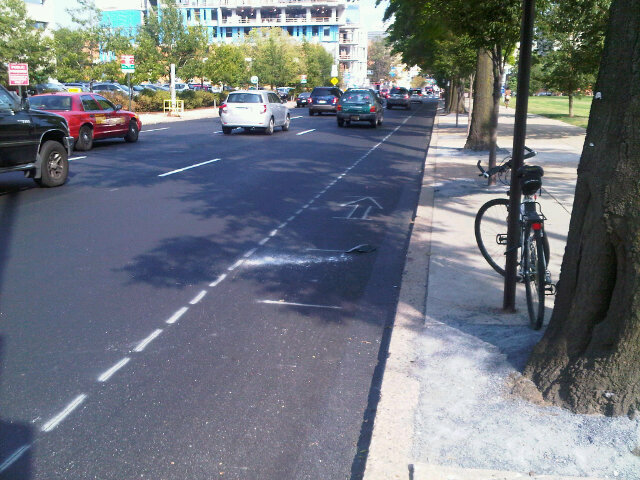 Chestnut Street is repaved (hooray!) As always the bike lanes get painted last (boo), and it looks like there will be no extension of the bike lanes west of 34th (hiss). Fortunately the new bike lanes on Market St connect via 34th Street to the Chestnut Street bike lane to create a contiguous if somewhat crooked eastbound route. Coming up next - a new bike lane on 30th Street between Market and Walnut with a contraflow northbound bike lane on the one way portion between Chestnut and Market. We hear that this short but important connection could be done this fall. 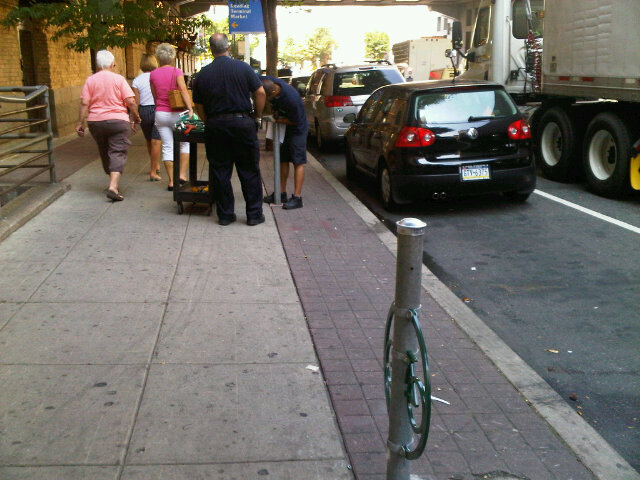 On Thursday Philadelphia Parking Authority employees were out attaching new post ring bike racks to meter poles on Arch St. at the Reading Terminal Market, a location that chronically suffers from a shortage of bike parking. Perhaps the best place to view Red Bull Flugtag on the Camden waterfront on Saturday is from the Ben Franklin Bridge walkway. This event, which is basically watching contraptions (and participants) fall off a 30 foot ledge, attracts huge crowds -Recent Flugtag events have drawn close to 100,000 spectators. Getting there by bike is a good idea. The starting temp on Sunday for the Philly Naked Bike Ride at dusk should be about 71 degrees with a breeze of around 11mph. Not as chilly as last year but it may be a bit cool after sunset. The fact that the bike lanes are not extending past 34th street is ridiculous! This creates highway like conditions from about 43/42 street to 34th street. And 34th street to 23rd street is always driven on like it's a high way already! I know the south street bridge is coming back online, and we have the option of crossing over to center city by way of Spring Garden as well, but for those who don't want to shoot behind the Art Museum or go around the circle, or be on South Street and have to head north, we need a straight shot into Center City. Treating our inner city roads like highways is not a responsible transportation policy. I agree with Taggart! Where was the Coalition in the designing and repaving of a critical route for cycling in the city? Why are the "new" bike lanes actually more narrow on a newly painted road? Why is what used to be an informal, no parking, bike lane now a parking lot west of 34th street? I watched a stream of cyclists this evening at 36th and Chestnut with cars honking angrily at them and speeding past at 50mph as close as they could get. You really think Market is a good alternative?? And, since I'm on a roll, I find it difficult to celebrate the "creation" of bike racks when they could very easily have just left the heads on the meter poles and the result would have been much more user friendly. The Bicycle Coalition submitted a battery of recommendations for the stimulus repaving projects that the City is currently undertaking including bike lanes on Chestnut St. The response that we received for Chestnut is that a traffic study is needed for the section of road. We are following up with the Streets Dept. and asking them take a look at streets where bike lanes were rejected for possible solutions and we will be asking for the addition of Sharrows on Chestnut. The 2nd Phase of the Bicycle and Pedestrian plan will kick off this fall and will offer the public opportunities to comment on needed bicycle improvements in places like West Philadelphia. Well, at least we tried. Thank for the response. I think it's funny that they want a "traffic study" but turned a former lane of traffic into parking in the 3400 block.